This style is a modern take on and old classic. The delicate scallop set shoulders of this ring really set off the graduated diamonds in this 3 stone ring, and ensures maximum sparkle right across the wearers finger. 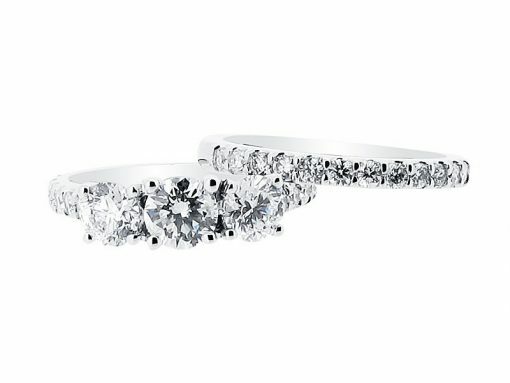 Here in Voltaire Diamonds we specialise in sourcing the perfect diamonds for each client, and this ring can be tailor made to suit all preferences and budgets. We use 18ct white gold, 18ct yellow gold, 18ct rose gold and platinum for all of our pieces and this ring can be made in whichever is your favourite. As seen in the image, we stock matching wedding bands for all of our rings, which takes the guesswork out of choosing a band when the time comes. Contact us on 01-6778449 or info@voltairediamonds.ie to book your private consultation now!